It seems everyone these days is making artisan bread. I thought I was on the right path by making five minute no-knead boule dough, whose proponents claim for it the quality of artisan bread without the starter and all the effort. Recently, though, I received a 20-year-old starter from a bread-baking neighbor–and now everything has changed. The starter, housed in the bowl my grandmother used for making cornbread for my grandfather’s nightly supper. Suddenly, I had a heavy responsibility in my hands. The starter was born around the time I began graduate school, possibly just as I was leaving Durham for Wisconsin. It sat in my neighbor’s kitchen as I meandered across the United States for 20 years, perhaps waiting for me to return to Trinity Park. Worse, it was the beloved child of a man with a structure behind his house dedicated entirely to a wood-fired oven–a wood-fired oven for baking loaves of bread. David, the starter’s parent, delivered it on a day when Fred was at home. When I got back, it was in a jar on my kitchen counter. David had provided a spreadsheet for the baking process too. He told Fred to let the starter sit out for a couple of hours and then put it in the fridge. “She’ll know what to do with it after that,” he said. I felt just as I had when I first read postmodern literary theory, around the time that damned starter had emerged from a combination of flour, water, and whatever yeast and bacteria floated around Trinity Park circa 1990: “How the heck had I never learned any of this?” My mastery of the bread baking techniques outlined in my 4-H Club booklet had failed me. I could not bear to tell David that he had turned a portion of his precious 20-year-old starter over to the bread baking equivalent of a crack-smoking nanny who’s never changed a diaper. Especially a man who had spent tens of thousands of dollars on an oven just to bake bread. This process takes anywhere from three to six hours, depending on the type of yeast you use. Yeast is a living thing, and the gasses it produces as it feeds make the bread rise. With commercial yeast–a product that was developed in the relatively recent past (a hundred years or so)–that process is relatively fast. In contrast, bread made from the kind of starter that I was given takes two or three days. The yeast and bacteria that create the rise come not from commercial starter, but from the air. The process looks more like this. 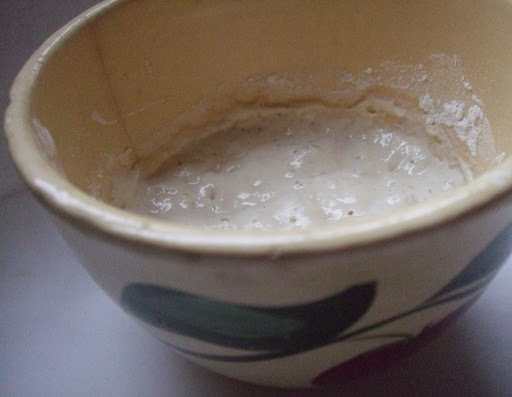 In the morning, take a small amount of starter and add enough water and flour to double. Let rise, covered, until bubbly. Add water and flour to double starter again. Let rise again until bubbly. Repeat. This rise will be overnight. Knead in salt. Knead a lot to incorporate air. Let rise in bowl lined with lightly floured towel, covered. Fold once or twice during rising. Shape into round loaf or loaves. Bake on stone in hot oven. Though the rising time is slower, there are advantages. Yeast in each part of the world produces a unique flavor (hence “San Francisco sourdough”), and so this technique is the best way to get that “bite” you find in a traditional sourdough bread. It’s hard to match this type of bread for flavor and texture. But there are additional disadvantages to this method–the biggest one being that artisan bread bakers are a fussy, persnickety lot, agonizing over issues such as oven spring, crumb, exact baking times, and so on. And there is an impenetrable chasm between those who measure their ingredients and those who weigh them. Measurers see weighers as inflexible, unimaginative dilettantes; weighers turn up their noses at haphazard cooks who treat recipes as culinary free-for-alls. This meant that there was no guidance on how to transform the weight-based percentages on David’s spreadsheet into cups and tablespoons. I ran the amounts through a converter, but I was still faced with the problem of the levain (yes, it’s the starter)–I couldn’t find a reliable way to determine its weight without a scale. And the amount of all the other ingredients–the flour, water, and salt–depended on that weight. To solve the problem, I ended up getting a scale, but the good news is that I also discovered that if you are not one of the fussier types you can make good artisan bread with no recipe at all. I’ll post on this next time. This entry was posted in Breads and Grains. Bookmark the permalink.